Diane Abbott is hardly a reliable witness. Firstly, she was not actually there and secondly her more recent record is hardly a gleaming beacon of leftist political action. The extract from 'Uprising' is interesting but hardly objective, using hearsay as facts. It's true that the riots were something of a watershed in British social history but middle class reporters have a tendency to romanticize mundane facts. I know that Diane Abbott might not be a reliable witness, I included her piece precisely because it shows how far someone can travel in their political views, and also because it is an authentic example of how certain kinds of leftists viewed the riot at the time. As for the Uprising book, it was written at the time by journalists who did not have a particularly romantic view of the riots, but may not always have got their facts right. Are their things in what they say that you think are factually incorrect? Hi, Please could you tell me the title of the article Diane Abbot wrote in The Leveller, no.38, March 1980? Thanks! I was there on Grosvenor Road when it kicked off. There were far more than 100 police. Many were young police officers who were trembling in their boots. I think it was deliberately provoked by the government as an excuse to upgrade the police riot vans and test the riot equipment -shields etc .It was carried out at high profile school home time so as to have maximum audience effect. It was an example of old white men in power pitching young men from different communities against each other ( ie the police and the locals) Many people there were white.People were arrested indiscriminately. Older people were hiding in their flats terrified of the police.The side streets had already been blocked off to prevent kerb crawlers and reduce traffic circulation. The police were lost -many had been drafted in to the area. I sa a police landrover driven in panic up one of the side streets -it was blocked off -in the haste to turn round it pinned a young man up against the wall trapping him . The community surrounded the landrover and lifted it up and turned it over. This was teported by the media as wanton violence and destruction. 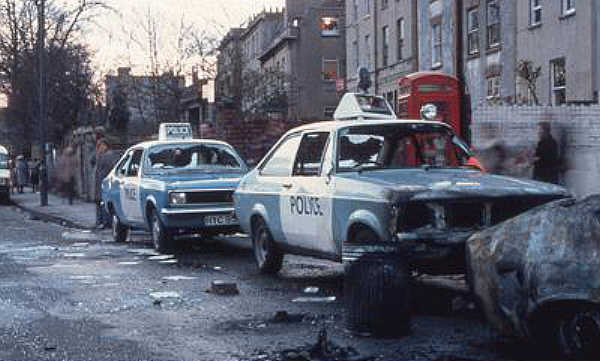 There are no words to describe thd sheer affrontery of what happened that day and to my mind it was designed as a show of force and control by a powerful state which was traini g its police officers in riot and street battles as they also upped the anti with the miners.